Hi. My name is Andy Baker, and I am a client. I’m a client – I’ll admit it. But, I’m also just a guy. Named Andy. I’m married with two kids, have a pet frog named Frack, and I loved “Pacific Rim” because it was so dumb. I’m also the Senior Vice President and Group Creative Director for National Geographic Channel and Nat Geo WILD, managing and directing a talented in-house team of designers, producers, and writers. We create a lot of work in-house, and we also hire many people to help us with our print, TV and digital campaign materials. Which means that I am often referred to as “THE CLIENT.” I’ve never relished the role of being ‘The Client’, since I’ve concepted, written, produced, designed, shot, and directed thousands of TV commercials, trailers, print ads, billboards, and digital ads for National Geographic and FOX, ABC, & NBC for the last 19 years. However, having experience as both The Client and The Creative gives me a unique perspective on the dynamic between those two entities. Clients are traditionally seen as commissioners, approvers, and financiers of creative work, but rarely the authors of it. And many creatives are intimidated by clients, annoyed by them, resent them, or most often are simply confused by them. And that’s where this blog comes in. I realized that there was something missing in the blogosphere, and in our industry. And that’s the client’s perspective. As much as I hate to own up to that term ‘Client’, I suppose sometimes it IS true. (And ‘Client’ is all relative, anyway – I answer to Nat Geo Channel Executives, and since I’m working to make them happy, technically they are MY client.) I hire and work with creatives all of the time, but I have begun to feel that a more appropriate term for what I am is a ‘Client-Collaborator.’ I prefer to team up with creative people to make great work, so this blog will be all about not only the client perspective, but also about the sorts of qualities in creative partners “we” (if I may speak for all Cientkind) are looking for. Because at the end of the day, I’m just a guy. Who likes to do great work with talented and collaborative people. So let’s begin with a project from last year that really began to change how I looked at the whole collaborative and creative process. 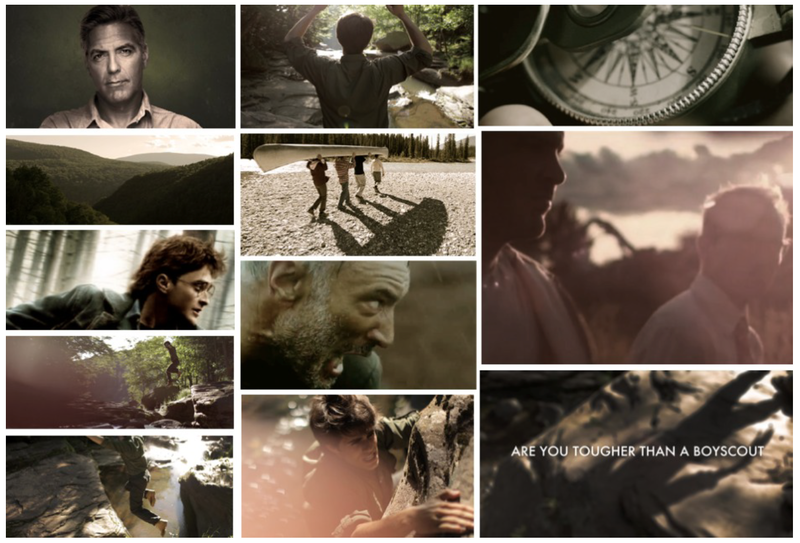 In May of 2012, the National Geographic Channel was in production on a new reality series called “Are You Tougher Than a Boy Scout?” The conceit of the show was simple – pit Weekend Warriors (older guys) who had never gone as far in the Boy Scouts as they had wanted to against badass Boy Scouts to see who was tougher and more skilled. The winner doesn’t get a million dollars, they just get to feel good about themselves if they beat some kids in a series of challenges (bow & arrow, running, canoeing, etc). 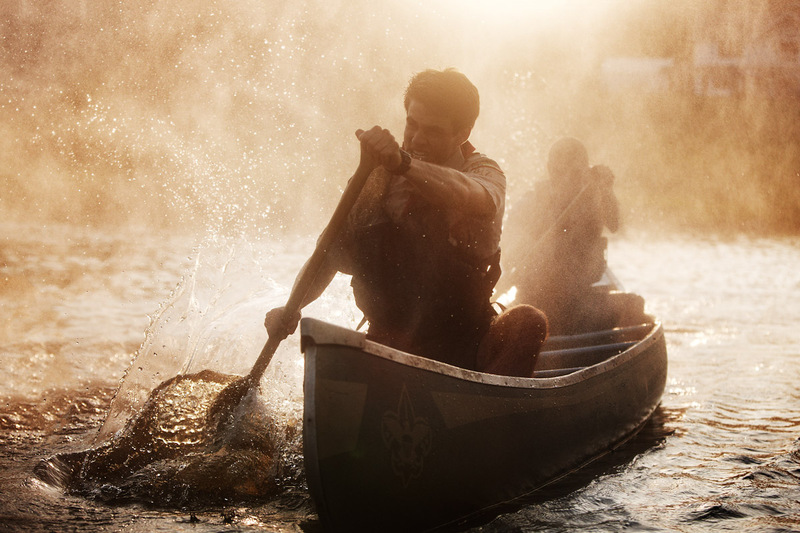 Our challenge was to make the Boy Scouts tough, gritty, and not to be messed with – true competitors and action heroes. We wanted to create something that felt raw, unvarnished, and action-packed. Muddy, sweat-soaked and fearless. These are not the Boy Scouts you’ve seen helping Granny cross the street. And as an adventure-reality series, we wanted to make this authentic, while also maintaining the high-production values that people expect from Nat Geo. We had no show footage. They were still shooting the episodes, and we wanted to take advantage of the chance to shoot while the show was shooting to turn around some big tease promos early. So we knew we needed to do a live-action shoot on-location…which was in the middle of a National Park accessible only by raft and 4-wheelers. To accomplish all that, we tapped the team at Variable, a small production company out of New York that we’d previously partnered with for a promo campaign for NGC, to do the production and shooting for our upcoming launch spots. We also hired photographer Joey L. to shoot all stills and portraits, as we had a robust plan for print and outdoor for the campaign. 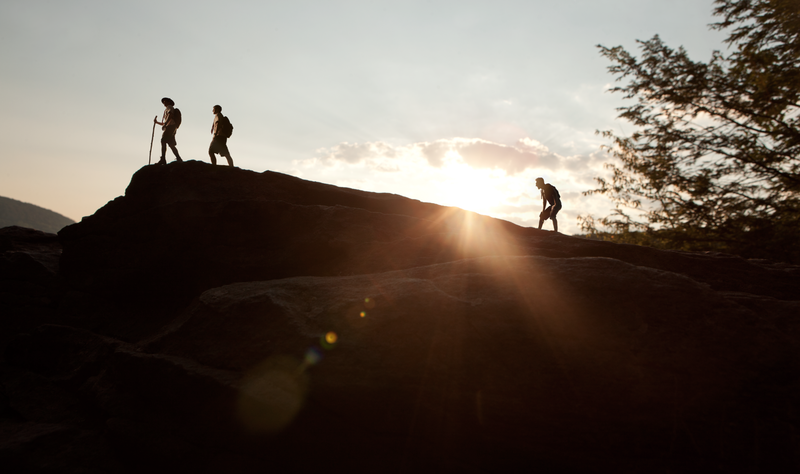 There were many, many details to be sorted through, and while we initially planned to shoot in California where the show production was filming, we decided in the end to shoot closer to home (for budget and State Park permitting reasons) in Upstate New York. The number of logistics to plan was pretty staggering, but in the capable hands of Variable Producer Tyler Ginter and his team, we ended up at with a great location that could accommodate all of our action-packed needs. We collaborated with the Boy Scouts of America and had several Scouts and Scout Masters from the NY area come up for the weekend not only to serve as characters in the promo, but also as experts and authenticity-checkers for every scene. We gave Variable a comprehensive download on the show and our marketing goals. We really wanted to make something that felt richer, and more cinematic so it wouldn’t feel like just another reality competition show. They came back with a comprehensive creative brief outlining lighting references and shot suggestions. Early on, collaboration was the key, as we had twice-weekly calls dialing into every aspect of the shoot – props (ensuring authenticity), shot-lists (how we would portray the Scout v. WW’s challenges was important), wardrobe (you’d be surprised how precise the Scouts are about uniforms), and even the crew’s language on set (with kids on set, the Scouts understandably wanted to make sure it was all ‘clean’). We established a good dialogue with Variable and set the tone early for the collaboration that was still to come. On the photography front, we worked with the team at Canyon Design Group to sketch some initial concepts for key art – we then collaborated and discussed the best options with Joey L. and our internal Execs, picked out a half dozen options, and then Joey worked hand in hand with Variable to build a shoot schedule to accommodate both stills and video. Below you can see the one of the initial sketch concepts from Canyon, and Joey’s final photo plate as a comparison. My Executive Producer and I arrived on location (one that was reminiscent of the ‘Dirty Dancing’ set complete with lake, cabins, and woods) and we joined the Variable team, who had already started shooting since they got there a full day earlier. I was impressed right off the bat that the typical slow-moving formality of a big shoots wasn’t present, as they were already shooting anything and everything that might work for the promo. DP Sean Stiegemeier and the Alexa. Photo by author. 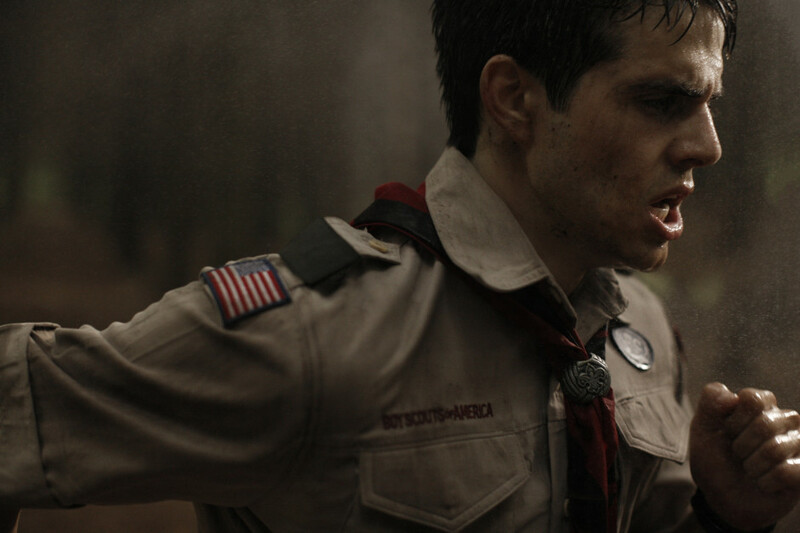 The crew had set up about 100 feet of dolly track in the woods to track the Alexa with the sprinting Boy Scout actor, and were dousing him with a pressure washer as he ran (set up on a parallel 100 feet of dolly track) to add the effect of rain and mud to the environment. Gritty intensity? Check! 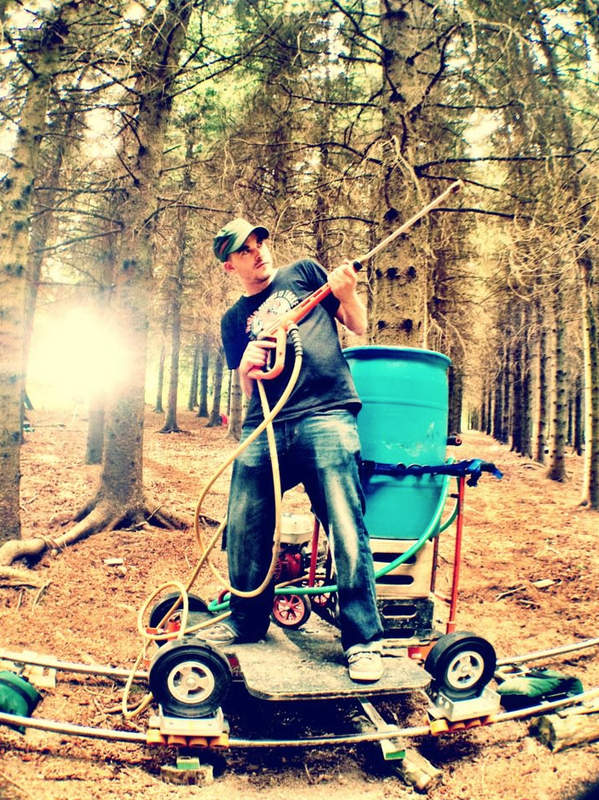 Jon Connor and the infamous pressure washer. So it was obvious early on in this three-day shoot that we were going to get good stuff. And that happened for a variety of reasons. The first was trust. As the clients, we knew that we had hired the right team for the job. We gave Variable the information they needed, and an outline and script for what we wanted to come home with visually. Then we let them do what they do best – make incredible images. We trusted them to do their job, and deliver the goods. But as the weekend wore on, something even better started to happen. We started to have fun as a team. While we had worked with Variable previously, it was for a one-day studio shoot in a very tight, controlled environment. This was a new experience working together in a larger location, and it took some time to feel the situation out. Another great thing about this shoot was that there was no ‘client village.’ Client village always feels a little too separating between creative teams to me – a Berlin Wall of creativity – and because of our modest budget, there was a very hands-on, nitty-gritty approach to capture the images we wanted. Variable had clearly pulled some strings to pull this off with our budget, so it was clear that it was all-for-one, one-for-all situation. We were all there with a common goal, and everyone was there to accomplish it together, as a team. We had the same vision, clearly outlined and discussed in advance – which ensured that there were no surprises along the way. I cannot over emphasize the importance of trust that makes any project like this a success. It’s simply critical. And as a client, it was important to show that we were right there in the trenches willing to do whatever it took to get the best shots. Between the trust and in-it-together mentality, I found that it got us way more intangible creative benefits than we could have hoped for. This shoot was also a watershed moment in my career in another respect. I’d always known when shooting that the more you shot, the more you’d get. That’s obvious, of course. But I’d never seen it on this scale before. For this shoot, we had a Canon 5D, a Red Epic, and an Arri Alexa on set, with multiple directors and locations. Some recent shoots I’d had previous to this one had operated a little differently. We’d had one director overseeing everything we were shooting, and that was the only camera rolling. This may be blasphemy, but after the experience on the Boy Scout shoot, I believe that the traditional single-director system simply doesn’t work as well. Or, perhaps I should say that it often doesn’t work as well when shooting for TV promos (as opposed to commercial projects). The reason is because we aren’t just looking to create one single promo when shooting TV series campaigns. We have shorter versions, multiple executions, and weekly episodic promos. There’s just way more to create than a single :30 spot. So why have one crew shooting one thing at a time when you can have three? Sure, in a small studio shoot it might be impossible, but for a project like this one, with so many talented creative people with great eyes and a common aesthetic and vision – there was no reason not to “rip” as much as we could in the time we had. Especially since our light was very flat and bright during the middle of the day so much of our shooting was restricted to the early morning hours and late afternoon-evening. So that’s exactly what we did, we constantly shot with every camera we had. DP Khalid Mohtaseb affixing the Snorrie-Cam. Photo by author. We used a Snorrie Cam mount for the 5D to shoot some POV shots of our Scout carrying a canoe over his head. Director Jon Bregel shot with the Red Epic to capture action scenes of our Scouts and Weekend Warriors (WW’s) battling, and DP Sean Stiegemeier shot on the Alexa on shore to capture camping and action scenes with other Scouts. Given the tight space on the boat in the lake (we had a rowboat with a custom-fitted PVC pipe attached to the Canoe to ensure the camera boat didn’t drift away from the Scout’s boat), I went with the Alexa mini-crew and never stopping shooting for the next 2 hours. If you had an idea for a cool shot, the offer was made, and we set out to get it before we lost the light. We shot while listening to the Red crew in the lake douse the Scouts and WW’s with a pressure-washer to simulate intense rapids and rain. The sounds of ripping great shots (and the pressure washer’s generator) echoed through the valley, and it was never more clear to me that the divide-and-conquer mentality was working perfectly. 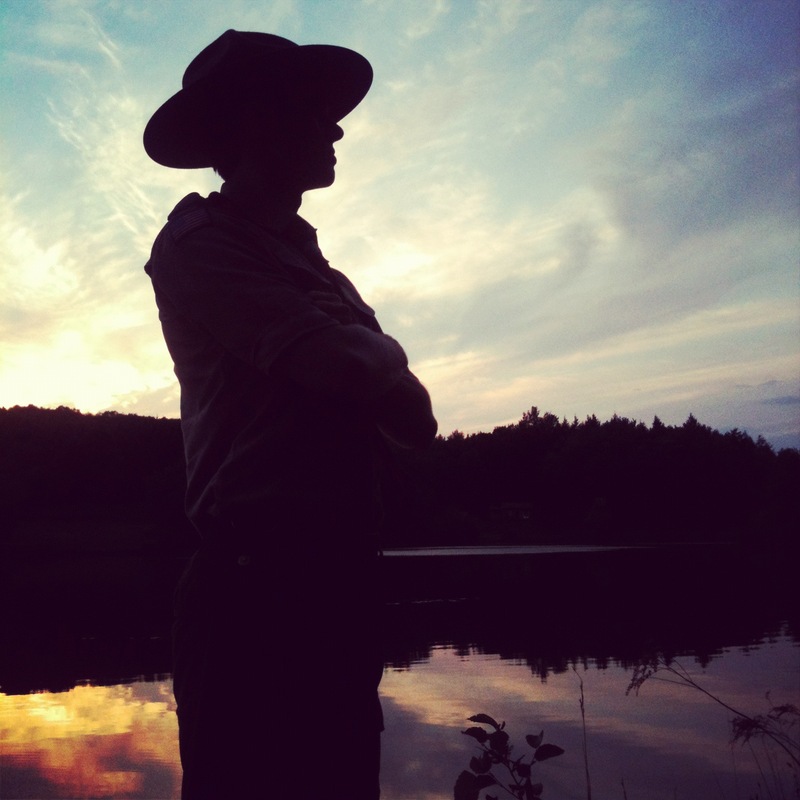 And when the boat crew was finished, the owner of the cabins quickly drove the actor to our side of the lake on a 4-wheeler so we could take advantage of the incredible light before it left. Everyone was in on maximizing the shoot time. 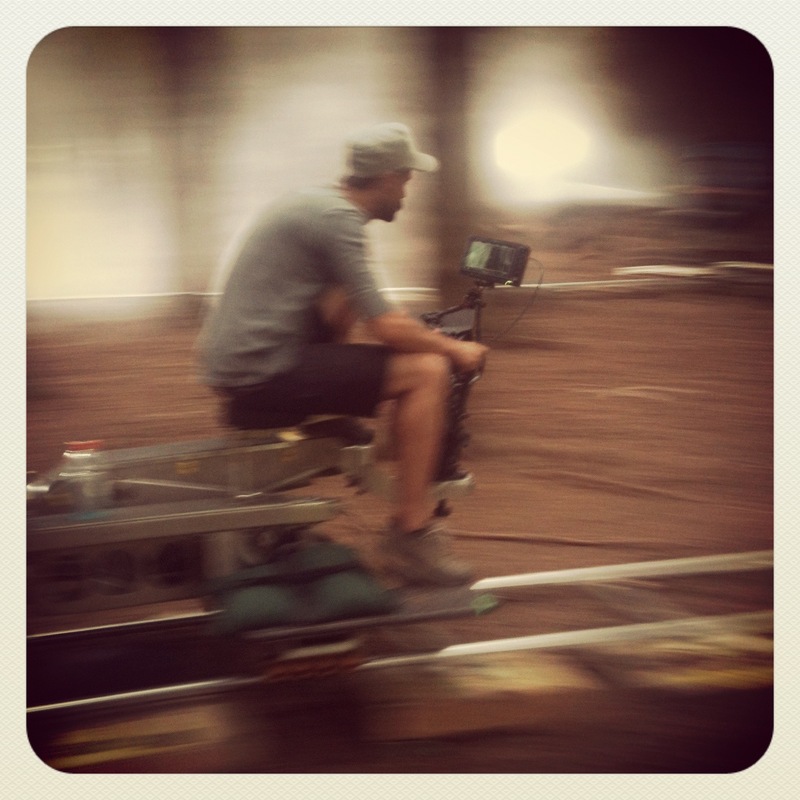 “Tank” the grip pushes dolly around specially rigged 360 degree track. Photo by author. In the following days, these same themes of trust, collaboration, overshooting, and creative-crushing continued. Variable set up a 360-degree dolly track in the woods to capture our ‘face off’ scene. This had never been something we’d asked for at any point, but Variable knew it would be cool. We had just wanted a face-off between Scouts and WW’s so they took the idea one step farther and we trusted them that it would be worth the setup time. (They were right) That illustrated another great lesson we learned as a client– keep the possibilities for your shots somewhat flexible and let the guys who will shoot it elevate The Ask beyond what you’d thought of before. Don’t just shoot what you storyboarded out – leave your options open. Your editor will thank you for it. TAKEAWAY #3: JUST BECAUSE YOU’RE A CLIENT DOESN’T MEAN YOU CAN’T CARRY A SANDBAG. Throughout the entire process, we operated as a team. If there was a crew call at 3am to shoot a sunrise flag-raising, as the client, we were there, moving gear and joining in. I gave shot notes and suggestions, but also deferred to the team when they had a clear idea for what they wanted. There was no ego on any side – we all just worked together and had fun making something cool. They were honest with me and didn’t sugar coat anything when we had some tough decisions to make along the way, and I was honest about shots I felt we had to have, and knew when to stand down when the crew was spent. And we helped move lights/gear, whatever was necessary. By the end of shoot, we were like a small family – and my view of how a shoot can work best for both the client and the production company was changed forever. Trust your team. Shoot everything. Be prepared (isn’t that the Scout motto, anyway?). Plan for everything, but leave yourself time to find things you never expected. Work hard & pull your weight. And most of all, have fun. After that shoot, my views changed a bit. A lot of my prior experience shooting on location was stress-laden days dealing with cost-overruns, draconian shot-lists, inflated egos, directors who had their own creative agenda, and fear of being seen as “The Client” with lame creative suggestions. But this shoot re-opened my eyes to the fact that shooting can be the ultimate creative experience. You film something, you MAKE something, and you do it with other people who love it as much as you do. You surround yourself with talented and passionate collaborators, and trust them, and work alongside them. Together you form a bond, and create stories that you’ll carry forever. 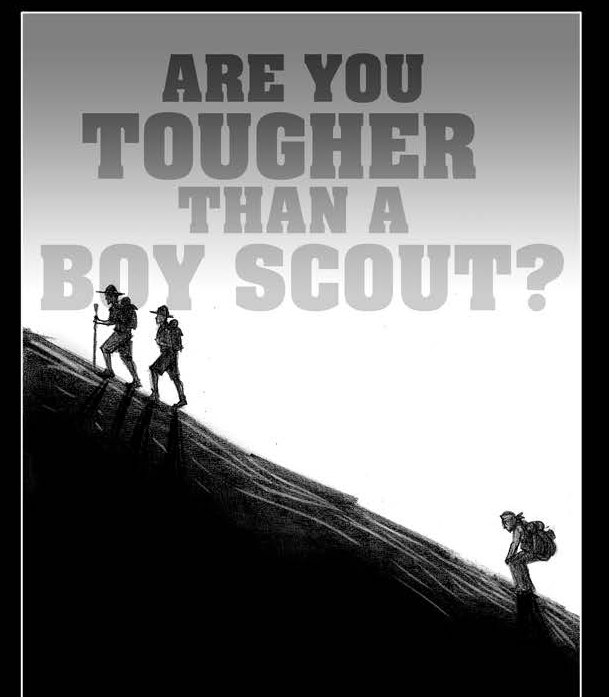 In the end, “Are You Tougher Than A Boy Scout” wasn’t a ratings hit for the Channel. It didn’t end up having any big billboards on Times Square, and wasn’t renewed for season 2. But there is no doubt that there’s a happy ending to this story. In February, we finally cut the promo (link below) with Ian Rummer at Crave Media (out of DC) and we accomplished what we set out to do creatively – make a pretty cool promo campaign. Perhaps most important, I’ve made good friendships with the team at Variable, Joey L, and many others on that crew – and collaborated with them on many more projects (to be featured in this blog in the future). 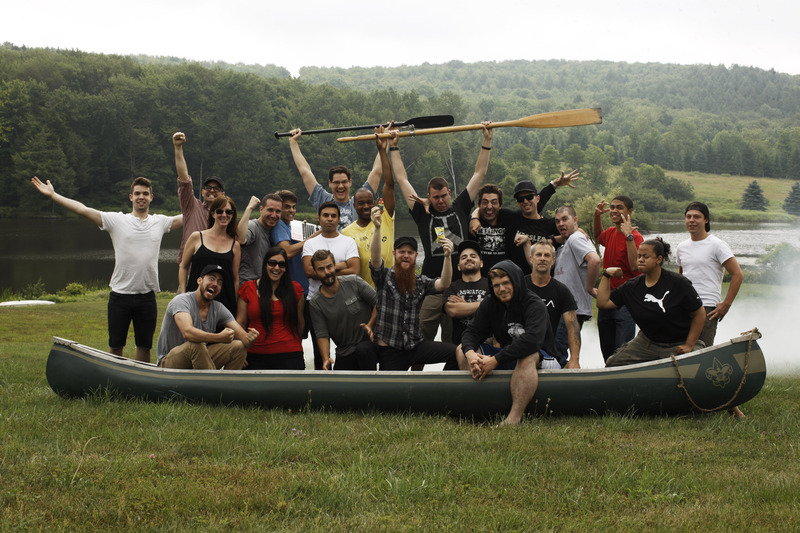 We still tell stories from that weekend in the woods – shooting, ripping, creating, and having fun as a true team. Thank you to everyone involved. Thank you for writing this, it is insanely helpful to see your side of things and what you think during a shoot. As an environmental portrait photographer I am frequently on shoots like this. Thanks for the fresh perspective. I hope to buy you coffee sometime and possibly work with you in the future. As a non-pro photographer interested in all things pro (I may take the jump sometime – who knows) – it’s enlightening to hear about the “other side of the fence” so to speak.